2 oz. eq. meat/meat alternate, 1¾ oz. eq. whole grains, 1/8 cup dark green vegetable, 1/8 cup red/orange vegetable. CCP: Hold under refrigeration (41 degrees F or lower) until ready for sandwich assembly. 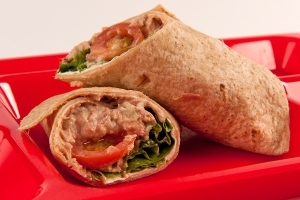 Portion one wrap (2 halves) for each serving. Each portion provides 2 oz. eq. meat/meat alternate, 1¾ oz. eq. whole grains, 1/8 cup dark green vegetable, and 1/8 cup red/orange vegetable. 1 serving of a Tuna Ranch Wrap.